Italian Avocado Salsa is excitement in a bowl. This is no ordinary Guac dip, it’s a spicy appetizer you won’t want to stop eating. 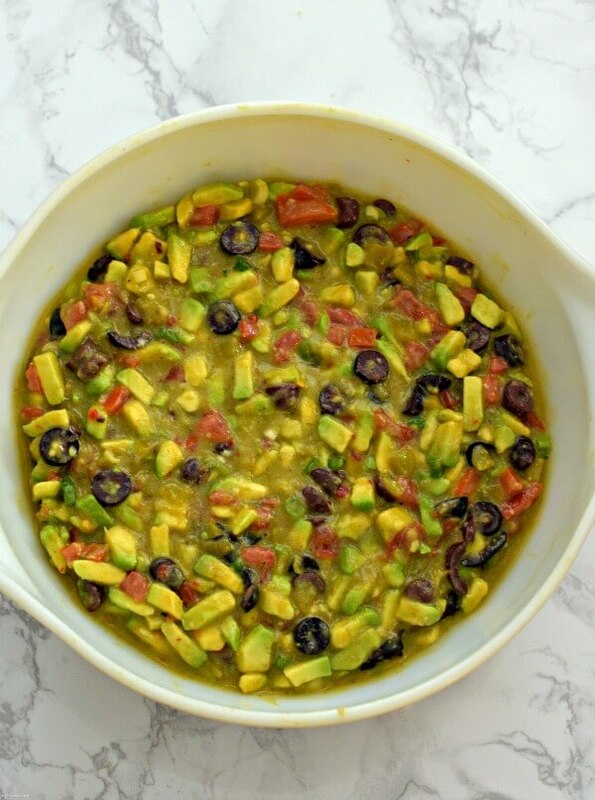 Diced avocados combine with tomatoes, onions, garlic, green chilis, olives, zesty Italian dressing, sprinkles of fried pancetta, and several splashes of an amazing smokey sauce to bring that salsa to the sublime level. This is a party waiting to happen. 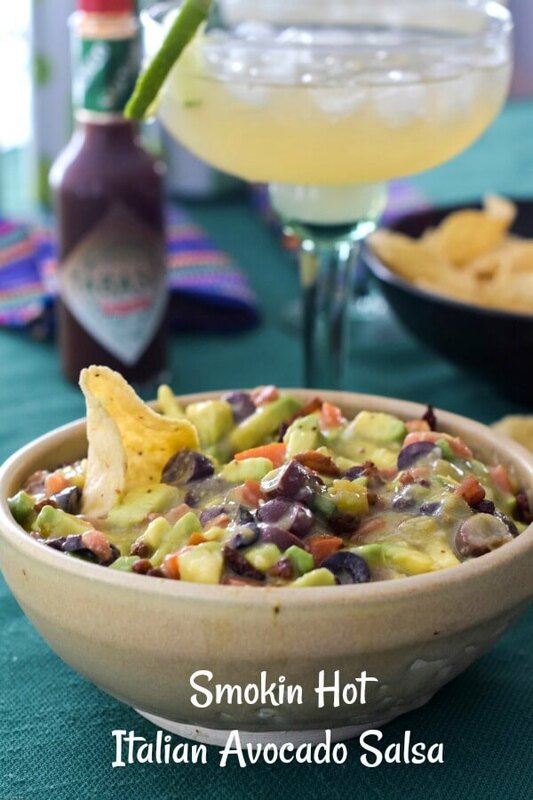 all you need are crunchy scoopers to enjoy the delicious salsa and something cold, fruity, and fun to drink, and we have the perfect beverage to compliment this appetizing chunky salsa. 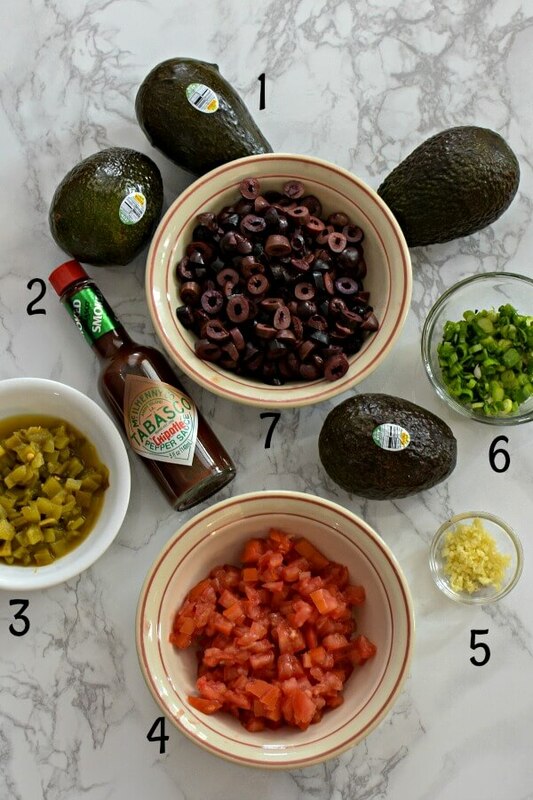 You will need: avocados, Roma tomatoes, Kalamata olives, canned green chilis, Zesty Italian dressing, green onions, garlic, TABASCO® Chipotle Sauce, lime, pancetta or bacon. We know what the Big Game day is all about don’t we? It’s all about delicious food and drink that load down the snack table while the game is going on in the background. It’s an indoor tailgating feast. And what would any game day be like without some sort of avocado recipe? I believe there is a rule somewhere that says that’s a must! Avocados from Mexico are an excellent choice because they’re always in season plus they’re healthy, delicious, and versatile. When we say they’re versatile, we mean they will make recipes from appetizers, main dishes, to desserts. You’ve got to check out some of their incredible recipes at Avocados from Mexico. 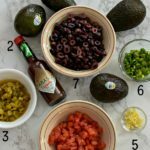 Getting ready to make the Italian Avocado Salsa with Avocados From Mexico and TABASCO® Chipotle Sauce. How are avocados good for me? Avocados offer nearly 20 vitamins and minerals in every serving, including potassium (which helps control blood pressure), lutein (which is good for your eyes), and folate (which is crucial in cell repair and during pregnancy). What about carbs and fat? This pear-shaped berry does all of the above while being low in carbs, low in saturated fats while being loaded with healthy fats and fiber. And here’s the real clincher — no cholesterol! Are they good for weight loss? Yes, they are good! The beneficial fats and fiber in the avocados helps you feel full and satisfied longer. No getting up from the table and wondering if you had eaten anything at all. Versatile Avocados from Mexico is the base for the Appetizer Ice the Delicious Fizzy Drinks. If you’d like to learn more about the benefits of avocados, Medical News Today has it broken down. We wanted a welcome change from guacamole. Well, to be honest our kids are the guac experts. Me? Not so much. So we wanted something scrumptious but different. So, we decided on an avocado salsa. If you’ve followed our blog for any time at all, you know we love spicy and TABASCO® Sauce is a staple at our house. When we need additional zip we grab for the bottle. 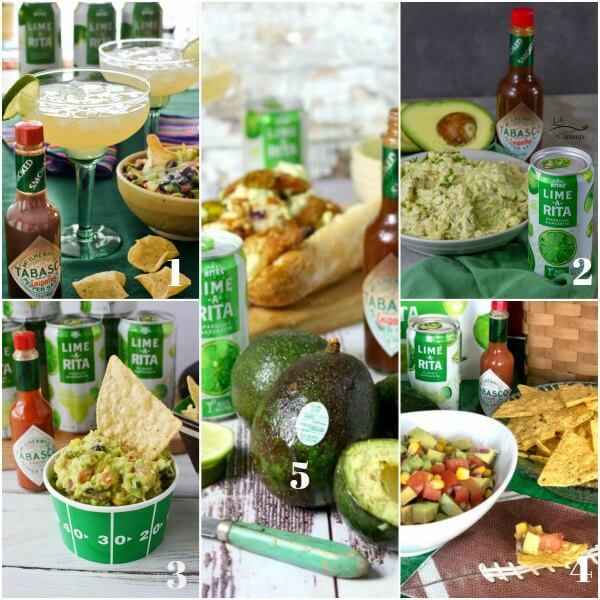 Getting ready for Game Day with the help of Avocados from Mexico, TABASCO® Chipotle Sauce, and Lime-A-Ritas. Use it as a condiment or ingredient. Spice up your dishes with the sauce. Add more flavor to your foods. Use as an ingredient to deepen and accent flavors. This wonderful sauce is made up of just three simple ingredients: red peppers, salt, and vinegar. TABASCO® Sauce is a wonderful addition to any dish. But this was not going to be any ordinary salsa, we wanted to give it an extra flavor kick. And that kick was going to come from TABASCO® Chipotle Sauce. This appetizer would have a winning Italian-Mexican flavor with a rich and smoky flavor from the TABASCO® Chipotle Sauce. For you spicy sauce lovers who want to know the heat level, The Scoville rating for the sauce is 1500-2000. And for those of you who don’t know what Scoville Heat unit ratings are, it’s a unit that measures the capsaicin which is the chemical in peppers responsible for their heat. Is TABASCO® Sauce non GMO? Yes, it’s non GMO and Gluten-free. Ingredients for Italian Avocado Salsa. 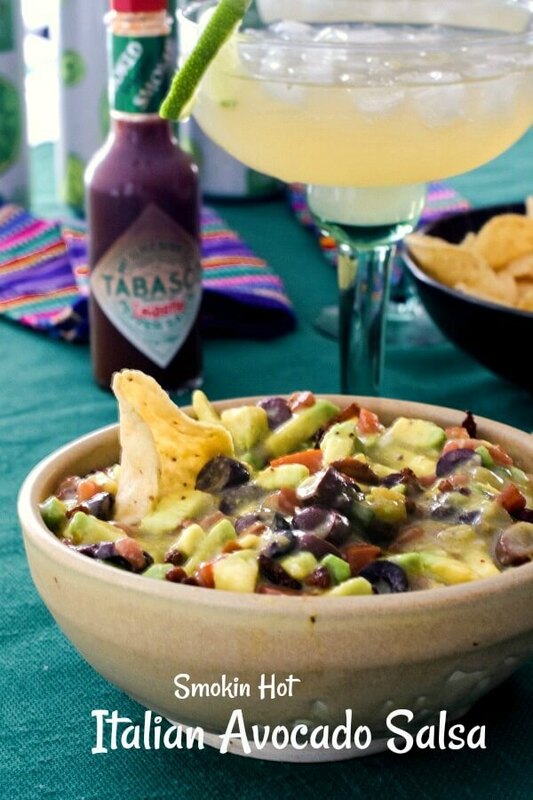 If you want to find some really creative recipes, from appetizers to desserts, check them out at TABASCO® Sauce. Yep! You can put some heat in your desserts too. One of the most important things you have to make sure of, other than buying Avocados from Mexico, is that the avocados are not overly ripe. For guacamole that’s great, but not if you want to peel, seed, and dice the avocados for salsa. You want the avocados firm, but not as hard as a rock. The same goes for the Roma tomatoes, firm but not rock-hard. Smokin Hot Italian Avocado Appetizer all mixed up and ready to chill and enjoy. The Italian comes from the zesty dressing that adds the zing, and the green chilis adds a bit of zip. 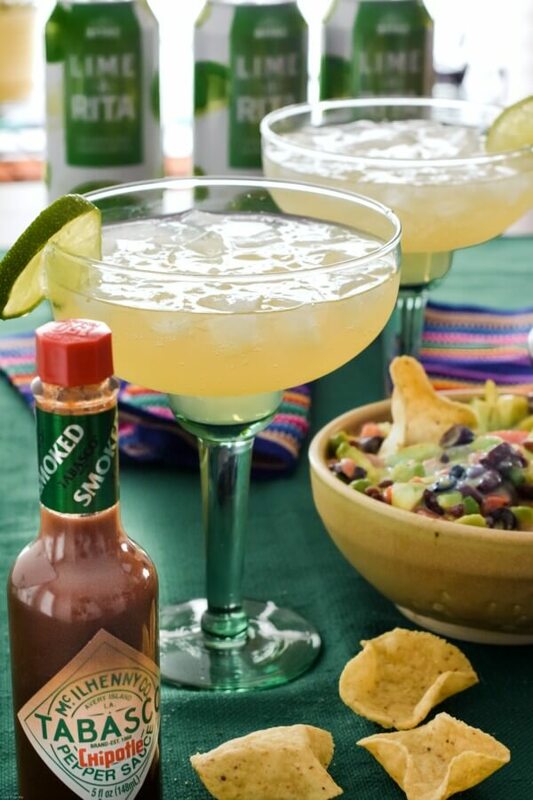 The underlying notes of smoky spice comes from the TABASCO® Chipotle Pepper Sauce. The green onions, garlic, and sliced black olives all add to the overall punch. The avocado salsa is a real medley of flavors. Now, once get all of your ingredient in a bowl, don’t over-stir. You don’t want to mash the avocado chunks. Then, put the salsa in the fridge and let the flavors combine to form one can’t get enough appetizer! 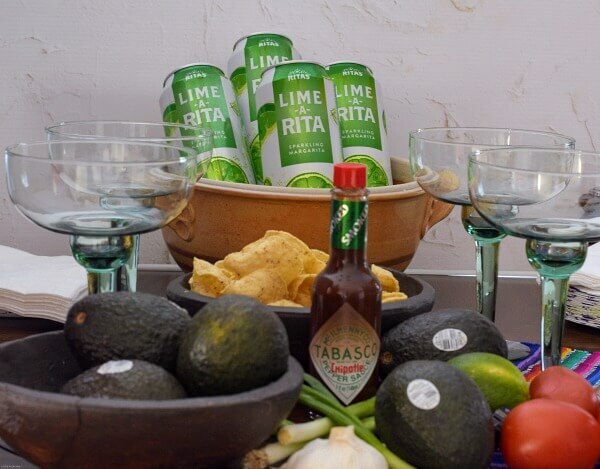 The Lime-A-Ritas and the Italian Avocado Salsa are chilled and waiting for the guests to arrive for The Big Game! THE RITAS they have just about any flavor you want. They even have seasonal flavors like Watermelon-A-Rita and Berry-A-Rita. 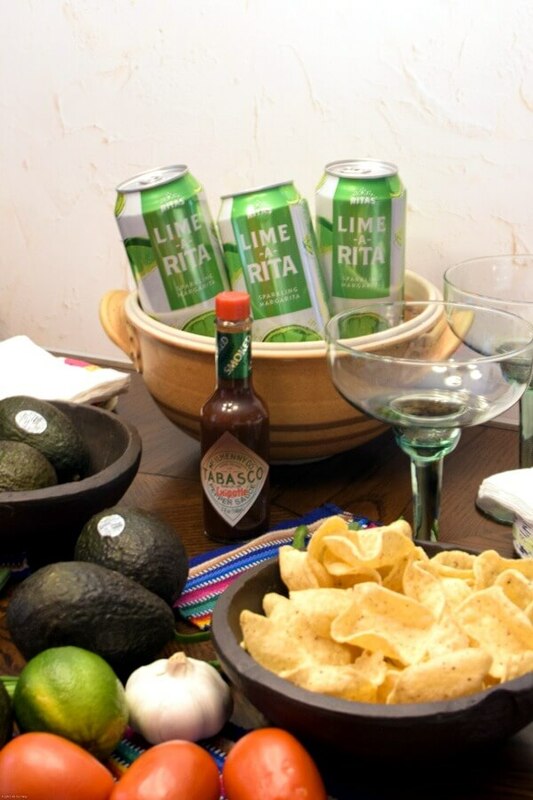 We wanted to stick to our Italian-Mexican theme for Game Day so we picked Lime-A-Rita for a nice fresh, fruity, fizzy taste. The drink will perfectly compliment the chunky spicy salsa and the salty scoopers. We thought we’d add to the fun by serving the Lime-A-Rita in a margarita glass. So whether your team is playing on game day or not, you’ll be able to savor winning flavors with delicious food and refreshing drinks. Find out more information for the party here! We hope you take our suggestions to guarantee a super fun, super special, super delicious Game Day! More Delicious Recipes to Enjoy!! These recipes are fantastic — go take a look! Just follow the Rafflecopter link to win! This is no ordinary appetizer, dip, or salsa! Nope! It’s spicy, flavorful and believe me it will be a huge hit at your next gathering. It’s a good thing this recipe makes quite a bit because you won’t want to run out mid-party. Be sure to get some strong scoopers because your friends and family will want to dig in and enjoy! A spicy salsa that is made from diced Avocados from Mexico, tomatoes, green chilis, and sliced Kalamata olives. It gets its Italian zip from the Italian dressing and the smokey TABASCO® Chipotle Sauce. If you want it hotter just add more sauce or a chopped jalapeño or two. 12 oz Italian dressing Zesty!! Fry the pancetta or bacon in a saucepan. Remove from grease and drain on paper towels. Set aside. Will add this on top. 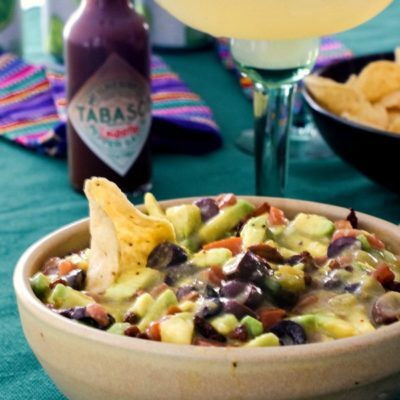 Add the diced avocados, tomatoes, green chilis, olives, green onions, garlic, zesty salad dressing, and TABASCO® Chipotle Sauce in a large mixing bowl. Stir very gently, you don't want to mash the avocados. Cover and refrigerate for several hours to develop the flavors. Serve with scooper style tostado or tortilla chips. Sprinkle the bacon or pancetta on top of salsa before setting out. Recipes and content from 2014-2019 ©All Our Way are copyright protected. Please do not use content or recipe without prior written permission. If you want to share the information please link to this post. Grazie! In my world, no salsa is complete without a nice cooling side of creamy guac. So adding the avocado right in there is brilliant. Why not just get all of that goodness in one scoop, right? Hands down my fave snack—and it’s nutritious! So much win. You know, I have a avocado salsa I’ve been making for years but it’s never once occurred to me to make it hot and I feel so silly for not thinking of it! Of course – it makes perfect sense! My husband would LOVE this – can’t wait to make it for him! What a great twist on flavors you have going on here! I would never have thought to combine the Italian flavors with smoky chipotle, but they work brilliantly together. I didn’t think guacamole could get any better, but I think you just did the impossible! I’ve never put pancetta, hot sauce, or olives in my guacamole! Who needs dippers for this? I’m going after it with a spoon! I love this dip! It’s a great recipe for when you’re looking for something that has a little spice in it and when you’re tired of boring guacamole. 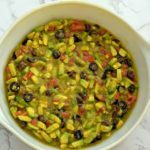 I’m always looking for an excuse to eat more avocados, and this smoking hot Italian avocado salsa sounds like a winner! I’m obsessed with spicy food, so I was happy to see that this salsa features a hefty dose of Tabasco. The perfect salsa for a game day party or to bring to a potluck! Yum. Everything about this. You had me at avocado…but I love your twist with the spicy and the smoky. Unique in all the right ways! Yum! Love playing around with different salsa variations. Thanks for sharing :). This looks perfect for the game today! I love a good hot dish and I can never say no to avocados! All the flavours here sound like a flavour explosion, I cannot wait to try this recipe. Such a fun change from regular guac. Wow! What a great giveaway!! I entered for all options! This salsa looks amazing! Loving all the ingredients! Thanks for sharing this…I like to make unique and different salsas and this one is just perfect! What an interesting combination of flavours and ingredients! I tend to default to a fairly standard guac recipe, but I like the idea of shaking it up and bringing in the Mediterranean influences! Cheers. This looks very spicy but really delicious! Thank you for the giveaway and awesome recipe! This sounds absolutely delicious. I love that it’s packed with olives and plenty of Italian flavors. It would be equally good with chips or even on top of grilled chicken. Forget about the chips! Hand me a spoon and I will devour that dip in an instant! 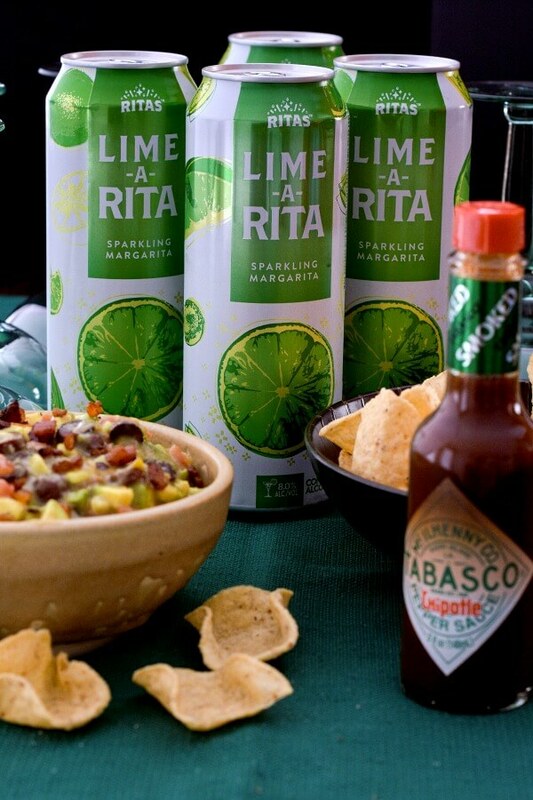 The LimeRita is the perfect way to wash it down! The salsa sounds delicious. I love a good spicy salsa with chips! You just took my favourite thing (Guacamole) and make it even better! I think the olives would add such a great flavour and texture to it, definitely have to try this one Marisa! I absolutely love the addition of olives in this salsa. Looks beyonds words delicious. It’s perfect for parties and celebrations. I’m having guest tomorrow. I’m definitely making this. Well, this sounds rather fun and flavourful! I love that there’s a lot of avocado in this dish and so chunky too! I’m going to pin this one to make for our annual Oscar night party! I just need to remember to buy avocados a day or two in advance. I can never find the perfect ripe avocado! Everything looks so yummy! I have a Avocado at home and I will try to do it as soon as possible. love love love this! what a fun and creative twist on traditional guacamole. def something i need to try making. I love game day food and this looks like the simplest thing to make. Love avocado and I love the creamy buttery types. Love all the flavors you have in this. Wow I would love to be coming to your house for any event or game day this looks fantastic as I am sure got devoured when you made it. I am the only one who eats avocado here and would love love love some of this! I’m from Florida — and we have avocado trees here, but they’re nowhere near the same as Avocados from Mexico. Ours are practically watery compared to the smooth, buttery texture of the haas variety. 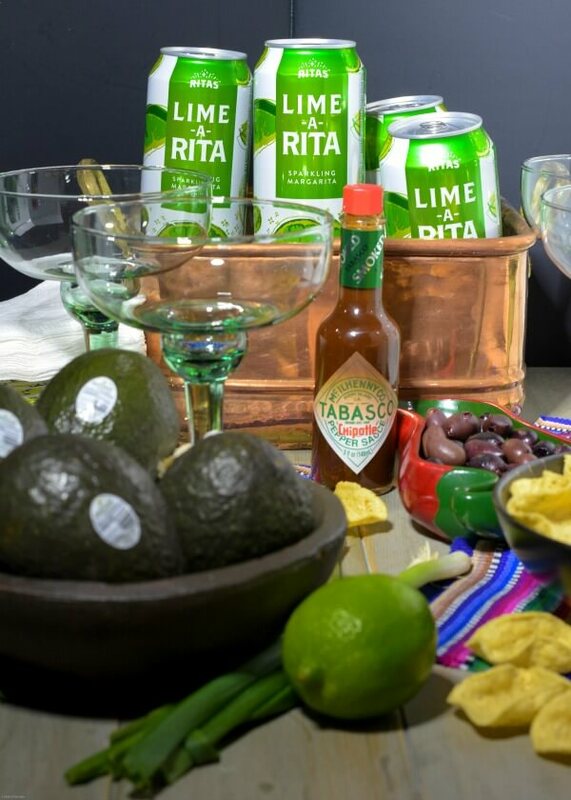 Your guac, with the chipotle hot sauce, a bowl of tortilla chips and a few icy ‘Ritas…. that sounds like a party in my mouth! i’m ready! Wow, this is really creative. I would have never thought to use avocados for anything but guacamole, but this salsa is giving guac a run for it’s money. I can’t wait to make this on Sunday! I love the pancetta in this! Avocados and Tabasco sauce are two of our favorite things. I’m thinking of buying one of those ridiculous sized Tabasco bottles for my hubby as he goes through it like water! Smokin! Looks so delicious. Im not a big football fan but I look forward to the big game every year. Indoor tailgating describes the day perfectly! And this salsa is just perfect. You are so right – I would love this guacamole. Looks fabulous. Wow, what tasty ingredients you have in here! I bet once you start dipping, you can hardly stop 🙂 . My hubby is hit or miss with guacamole. Me, I can just cut the avocado in half and eat it with a spoon. Now, this dip on the other hand I know he would LOVE. This is one loaded dip. So many flavours happening here. Hot and spicy is right up his alley. This would be a winner for sure.